An air ambulance service has taken delivery of a new helicopter for emergency flights in Surrey and Sussex. The MD 902 Explorer aircraft will be based at Dunsfold Aerodrome, on the border between the two counties. The air ambulance was launched in June with a Bolkow helicopter, following a £500,000 appeal in Surrey and Sussex. "It has always been our intention to upgrade the helicopter at Dunsfold to an Explorer," said operations manager John Tickner. "There are very few of this type of aircraft available and we are delighted to have finally taken delivery. "The unique, no-tail rotor design, higher payload and more cabin space and its speed make it a much better aircraft for air ambulance work than the Bolkow." Before June, Surrey and Sussex had shared an ambulance with Kent Air Ambulance, whose own helicopter is based at Marden. Since the Dunsfold base was opened, it has answered more than 200 medical emergencies with its specialist doctor and critical care paramedic. 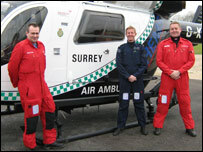 The air ambulance for Surrey and Sussex works alongside the counties' other emergency services, but is funded by charity. Running the service in Kent, Surrey and Sussex costs £3m a year.